Being an NFL prospect is like living life under a microscope. Every move is often examined and re-examined by countless scouts who are trying to find strengths and weaknesses in your game and personal life. The process of making it to the NFL can be a long and arduous process - flights across the country to meet with teams, training sessions with strength and speed coaches away from home, the East-West Shrine game, the Senior Bowl, the NFL Combine - each of these things takes on a life of its own, and it's a non-stop process of what they call a "job interview" to appease 32 potential employers. I can't say that I've been involved with every single aspect of this life, but I have had an opportunity to take a peek into some of it - and I can't imagine how they all do it. The scouts, the players, coaches, equipment managers, trainers, and other personnel. Over the past four months, I've been able to follow some of the top names in the country as they make their journey to the NFL. As I walked across the field at Ladd-Peebles Stadium with my camera in Mobile, AL, Andy Fenelon, one of the NFL's college football editors asked me for an image that he thought would do well on social media. 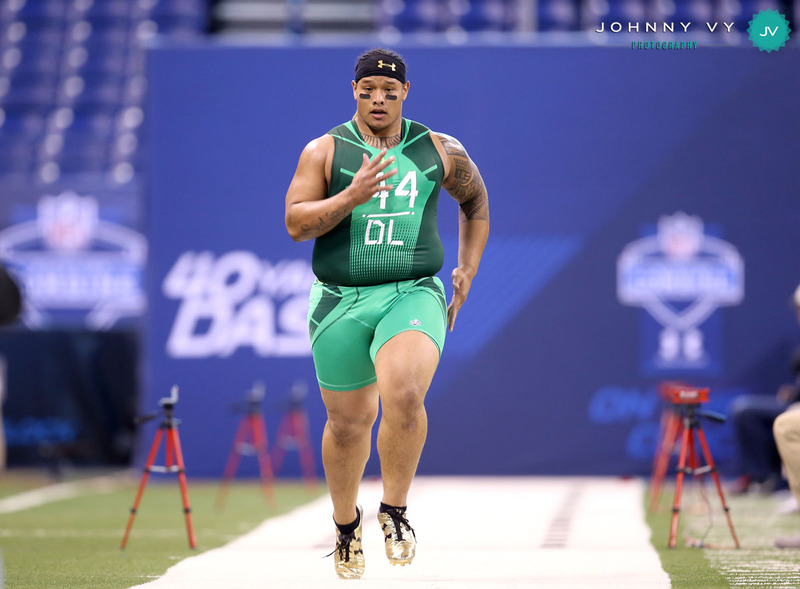 "Send me a picture of one of the big boys running through drills - people always love to see that kind of stuff." I'm no football scout, and I barely knew who some of these guys were, so I said "give me a jersey number and I'll make sure to get a picture of him." "How about #95 on the North Team?" 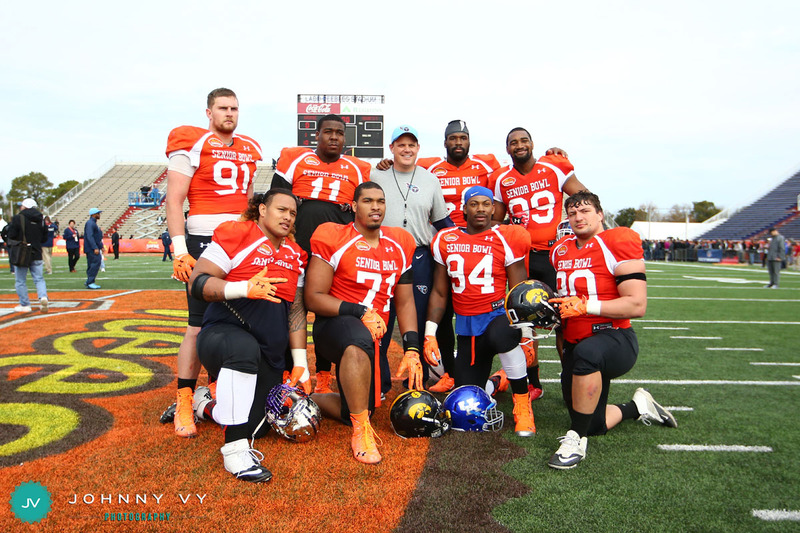 I went about searching for #95 during the North team practice at the Senior Bowl, and once I spotted him, there was no way I was going to forget him. 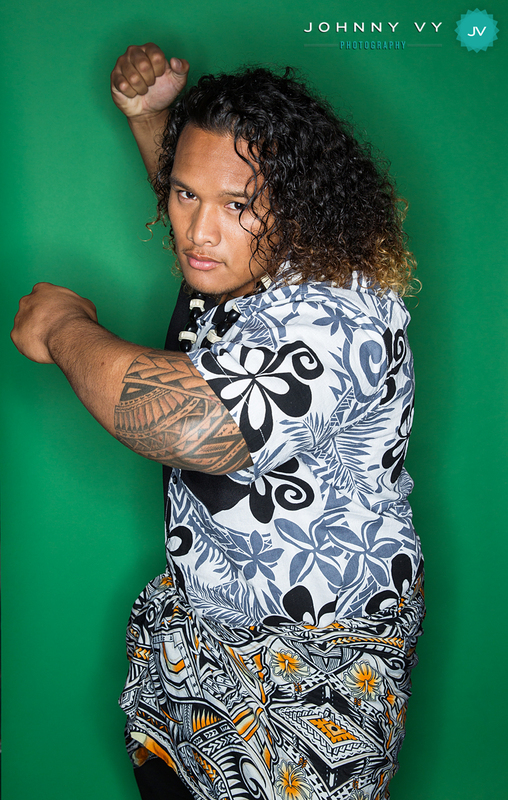 The guy's name was Danny Shelton, a massive defensive tackle from the University of Washington, and he had the biggest legs I have ever seen on a human being. 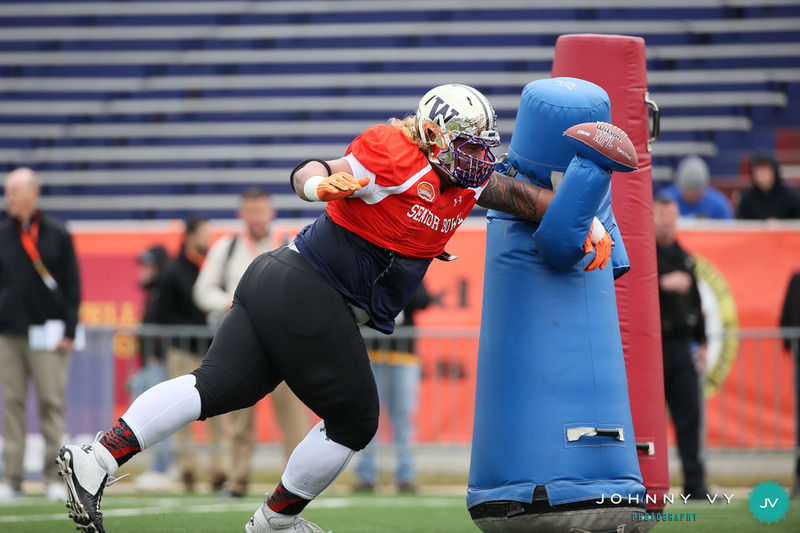 At 343 lbs, he was the one of the heaviest players at the Senior Bowl. Not only that, but the guy had strength and speed that defied his size. Perhaps it was that combination of size, strength, and speed, that made NFL scouts believe he was a top 10 talent in this year's draft. I didn't need to see any more of this guy to know that he was a special player. I snapped a few frames of #95 and sent them to Andy. 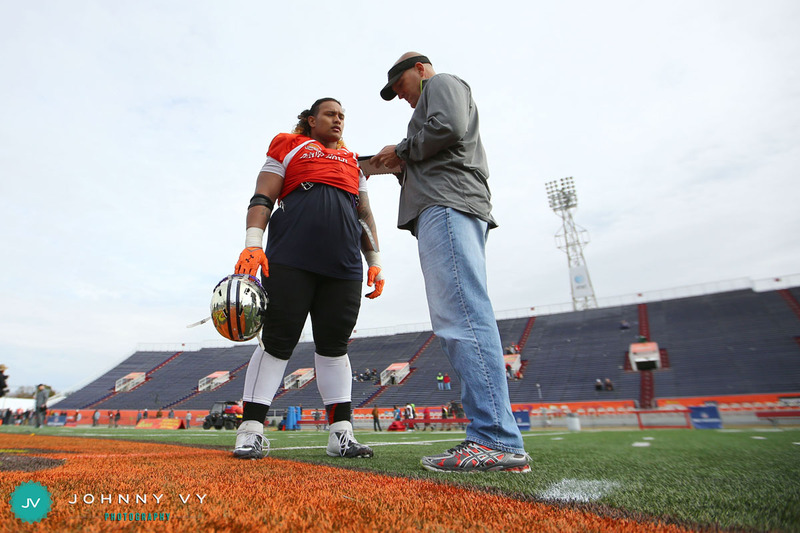 At 343 lbs, Danny Shelton was the second-heaviest player at the Senior Bowl. Being interviewed by an NFL scout. 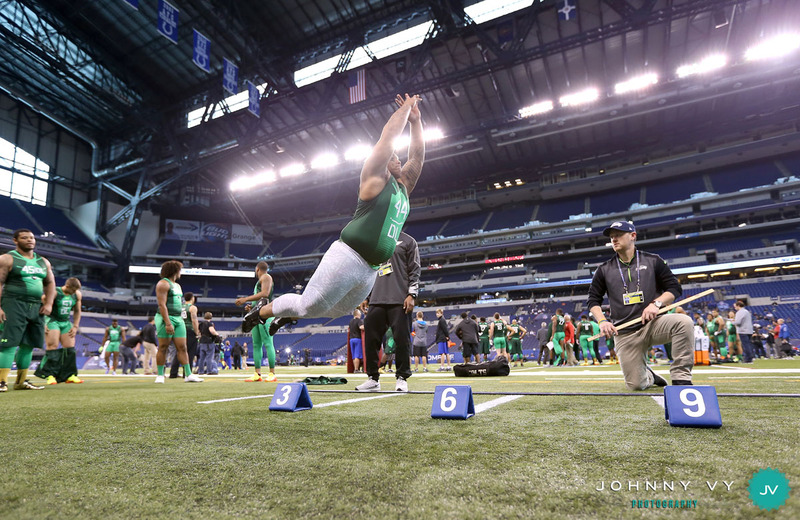 Not more than a month later, prospective NFL players made their way out to Indianapolis for the 2015 NFL Scouting Combine, where players are put through interviews, medical testing, physical and mental excercises, and who knows what, all in the name if determining if a team is willing to draft them. 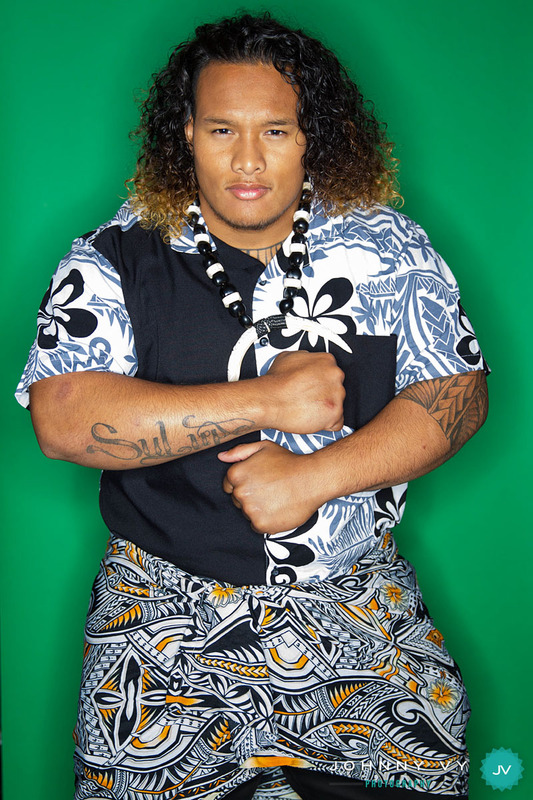 As the defensive end group walked out onto the field to begin their workouts, I immediately noticed Shelton, who was wearing a traditional Samoan lava-lava around his waist. I ran to grab my camera, but he had removed it before I got a chance to take a picture of him in it (this is kind of a unique thing, as most players don't show up with anything cultural or traditional. I was kind of bummed that I missed the picture, but I walked up to him and he immediately flexed and posed for the camera. A lot of times the players are so focused and on edge that they barely notice the cameras in front of them - which is understandable. Danny looked at ease, and completely comfortable, and I always think that it's kind of cool when these guys acknowledge that I'm there, and they look my way. Everybody understands, we're all just doing our jobs - the players are out there to perform, I'm out there making pictures, and we all share the same field. The fact that he flexed and posed for me made up for the fact that I missed getting a picture of him in his lava-lava - because nobody else had that picture of him flexing at the camera, but me. 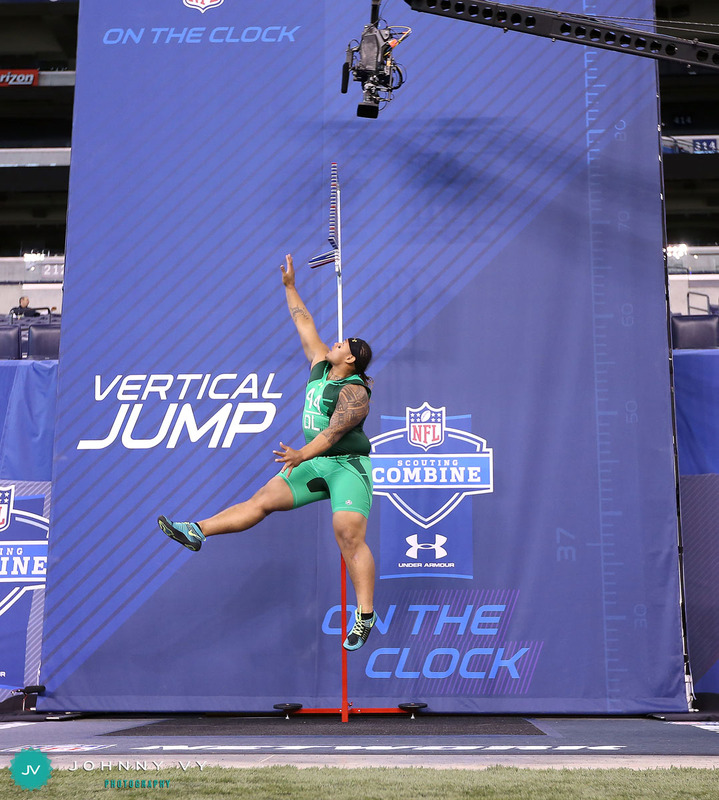 As the workouts continued at the Combine, I snapped a few frames and moved on to capture the other players, but made sure I was there for some of the bigger events like the 40-yard dash, the vertical jump and the broad jump when Shelton's number was called. 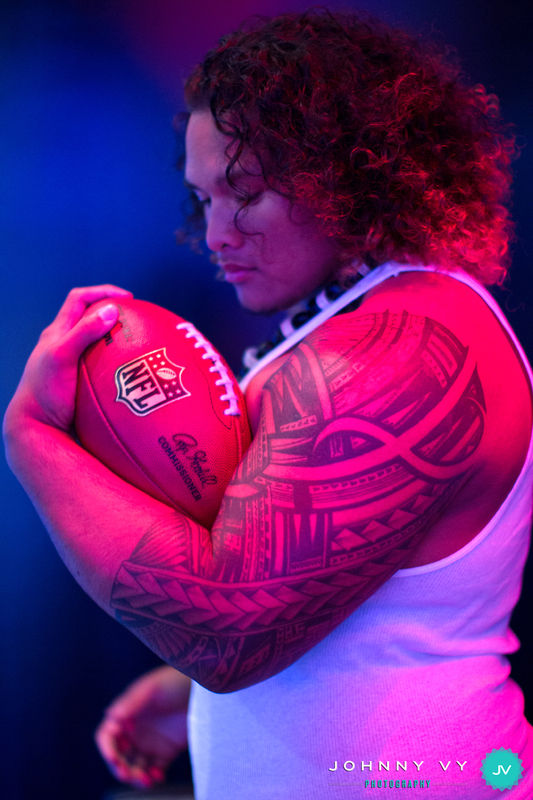 Two months later, I make my way into the NFL office and as I clocked in, somebody says to me, "I heard you're going to be shooting a portrait today." I hadn't been in the office for 2 months, and it was news to me that I would be shooting anything that day. I don't bring my camera with me into the office, so I was kind of freaking out that I didn't even have anything to shoot with. 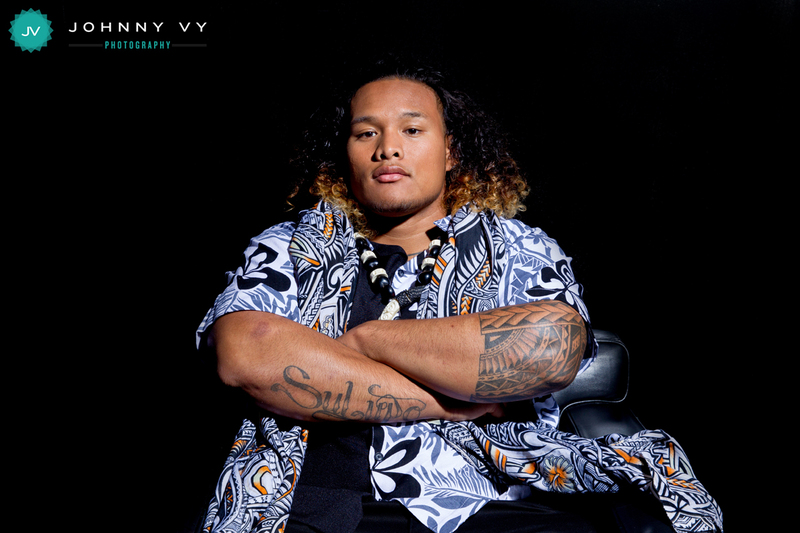 It turns out that Danny Shelton was in the studio to tape a few segments, and I was asked if I wanted to shoot a portrait of him. Naturally I said yes (I have never turned down an opportunity to shoot a portrait of anybody since the day I turned down a chance to photograph a portrait of Jerry West, which has been one of my biggest regrets of my career). I had just a few hours to prepare a portrait (much less conceptualize something), and gear that I am pretty much unfamiliar with (nobody likes shooting on cameras without their personal settings dialed in). So the portrait was supposed to happen at 2 pm, and I head over to the studio around 1:30 with a single Profoto pack, two heads, a green backdrop, and hope for the best. Danny had walked through the office earlier and had officially been introduced to me. "I don't know if you remember me, but I was there in Alabama and Indy." He mentioned that there were so many cameras, that he barely remembered anybody in particular. I noticed that he was wearing a Hawaiian shirt, and decided to go for a colorful backdrop to complement the style. 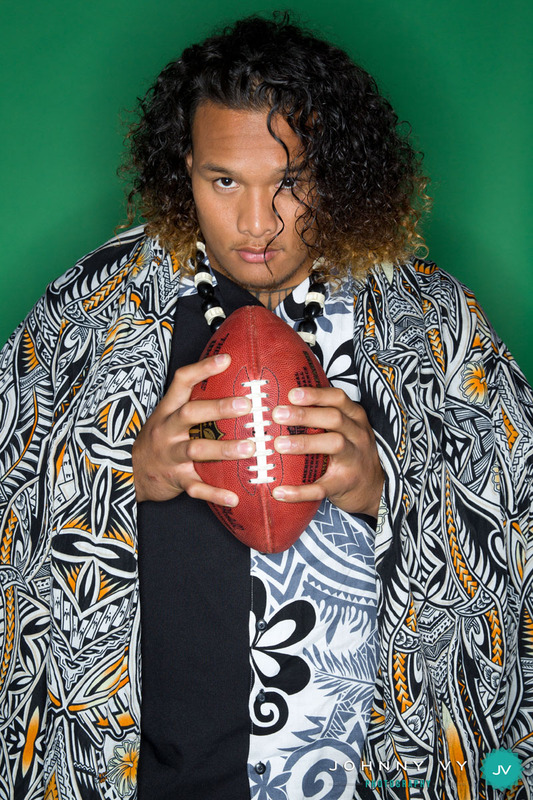 Normally, players walk in wearing suits, and they usually feel kind of out of place holding a football. I was actually really glad he wasn't wearing a suit and was looking more "like himself." Whenever I photograph someone, I really want their personalities to shine through, and I sometimes wish that I could get players into some different outfits if I could, so I feel that I was really lucky to be able to shoot this portrait of someone who showed up wearing what he usually wears. I got set up in the Network studio, where they were still filming, and in order not to bother the cameras, I could not set off my strobes while recording was going on. 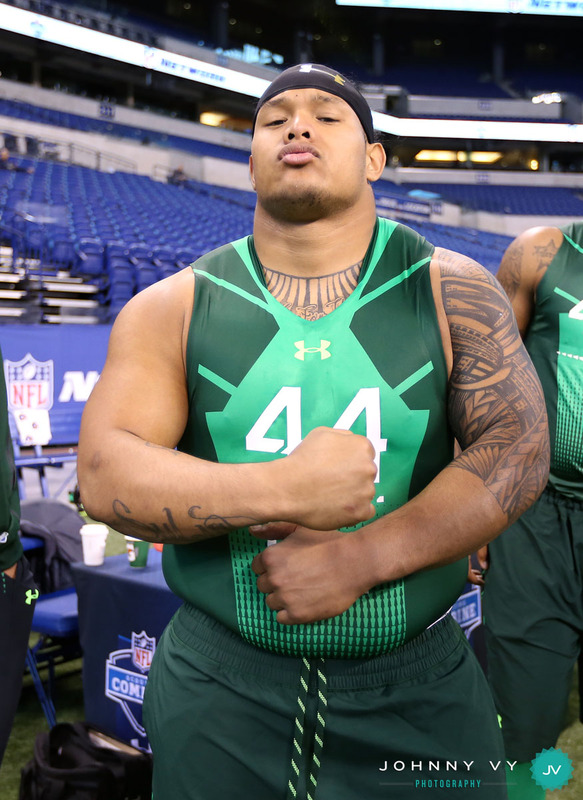 Danny hung out with me for a few minutes during filming, and I showed him some images that I had taken of him at the Senior Bowl and the Combine, and he said that remembered flexing for that picture at the Combine. I didn't shoot a single picture for about 5 minutes or so, while just asking about his trip to California and the whole draft process. "I'm just trying to take it all in right now," he said, and he literally looked like a kid in a candy store as he got to see the NFL.com offices and NFL Network set. You could really get a sense that he was extremely appreciative of everybody. Normally, I don't get any more than a few seconds with a player, let alone a minute or two (one player gave me only 2 shots, which I used to take a horizontal pic and a vertical pic). Between shooting, I shot a few frames, and then moved him over to a corner with a black wall, where I had set up a chair as my "second set." Since I had only one power pack, I had to set up a second head, and unplug the ring flash from my first set up - not ideal conditions when trying to get creative, but nonetheless, I was able to get several different looks. When the video crew told us to stop shooting temporarily so they could resume filming, I asked him about his tattoos, and if there was anything he'd like to show off. He then showed me the tattoo below his neck, and on his arms, and I asked him to remove his Hawaiian shirt if he was up for it. Comfortable as he was, he went ahead, and I was able to get some of the frames that I wanted - something that showed who he was. He showed up wearing a lava-lava, and I told him about the time in Indianapolis where I was kind of bummed that I missed the shot of him wearing it. This time, he game me more than enough time, and I was able to take some photos of the garment draped over his shoulders. On the back of the cloth read "Respect. 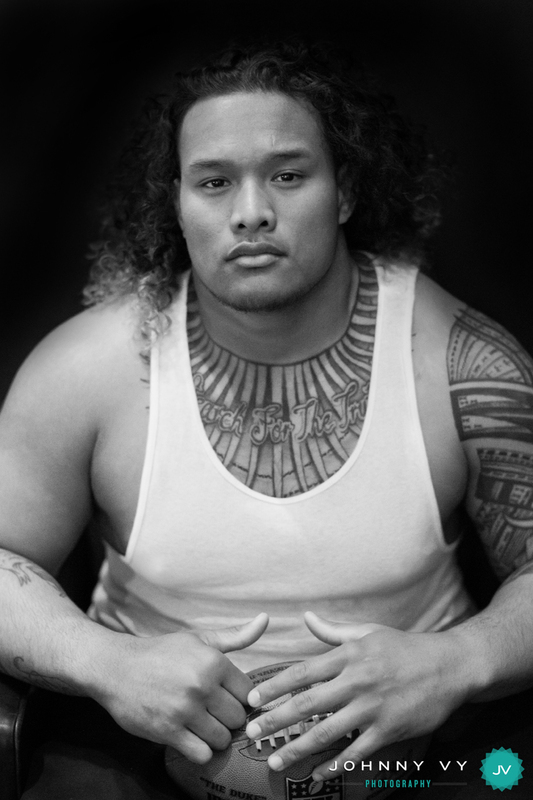 It's a Poly thing." That was important for him to show, and I'm glad that I was able to get a few frames of it. All in all, I spent about 15 minutes with him for that portrait. 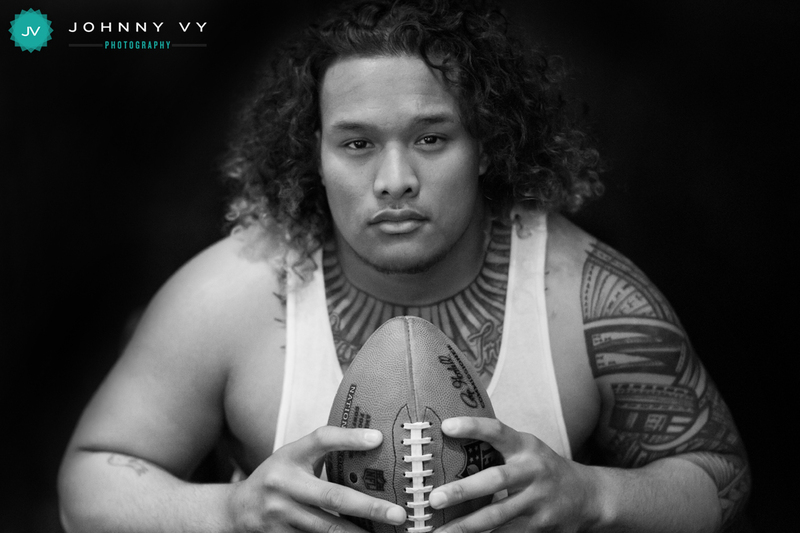 At the end of the shoot, he said, "thank you Johnny" and I wished him luck at the draft, and on his journey to the NFL. 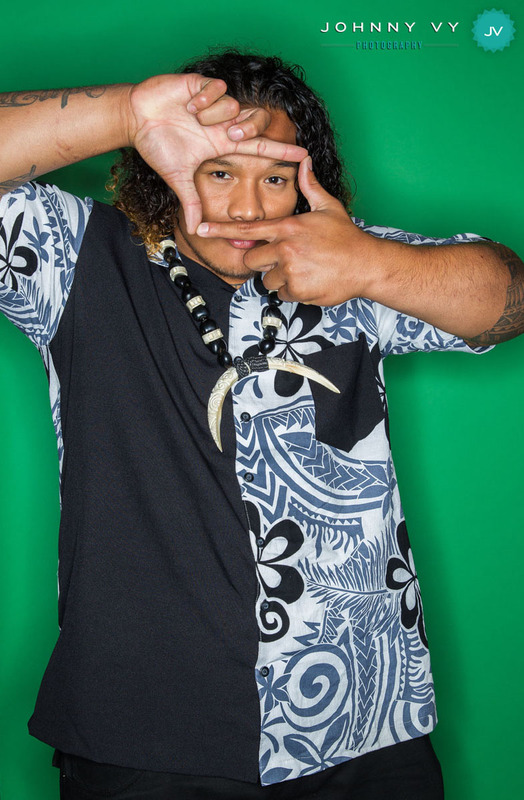 To this day, Danny Shelton has been one of the most unique and charismatic guys I have ever had the pleasure of meeting. 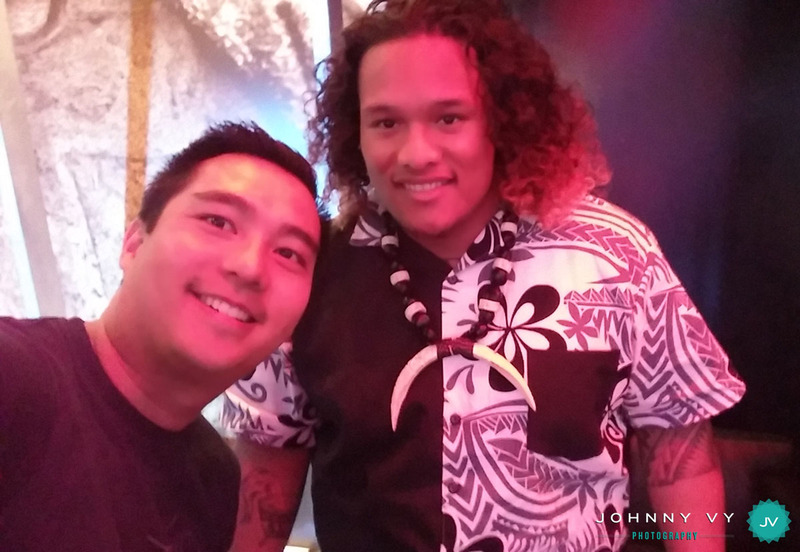 From the time I was just looking for a "picture of #95 with the giant legs," to the time I spent with him a few weeks ago, Danny Shelton has certainly gained my admiration and respect. 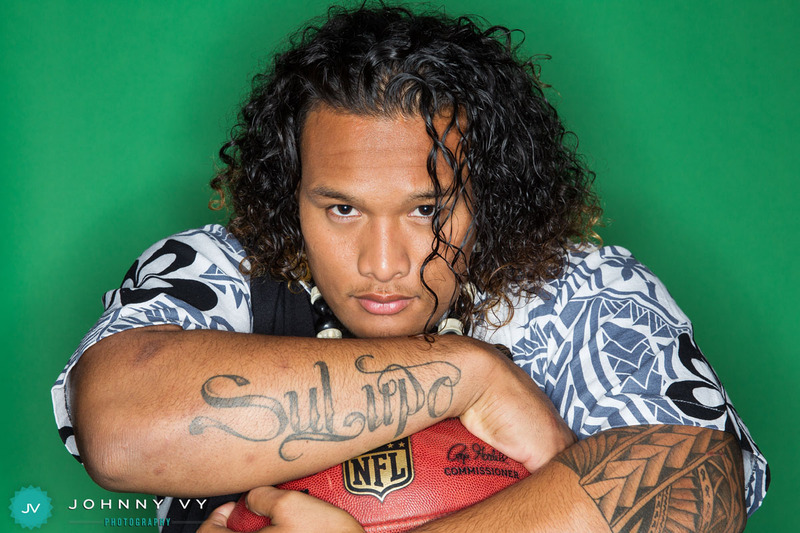 Get to know Danny Shelton: Read this fantastic article written by NFL columnist Michael Silver: The Hound and the Fury. All text and images on this site Copyright Johnny Vy. Simple theme. Powered by Blogger.